How pretty is this? Gloss 'n Sparkle Mirage. 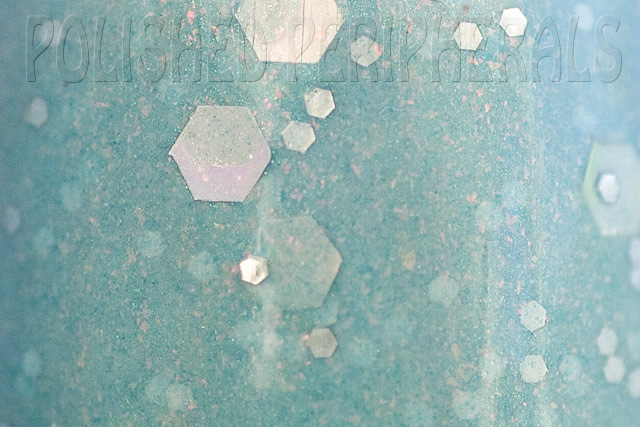 A gorgeous soft baby blue with pink/gold shifting glass flecks, small silver glitter and large silver holo hexes. This is 3 easy coats with a top coat. The glitter sits flat and dries smooth and it's opaque on it's own, no need for underwear. 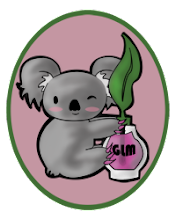 Mirage is available from Gloss 'n Sparkle's Etsy store She has a beautiful range of polishes (Unicorn Droppings is a must have) and I've just started using her cuticle oil and I love it. You can also check out the Gloss 'n Sparkle website and facebook page. I still haven't been able to find any of the Ulta3 magnetics to try but I did score one of the Sally Hansen magnetics when they first came out in the US. These are available in Australia now so I figured it was about time I blogged it. This is Magnetic Electric Emerald with a top coat of INM Out The Door Northern Lights Holographic Top Coat Gold (longest name ever!). It doesn't look quite this green in real life, it's more olive. I was actually disappointed with the colour, I seem to be on a never ending quest for a bright green magnetic. I like this green but I wanted more green IYKWIM. 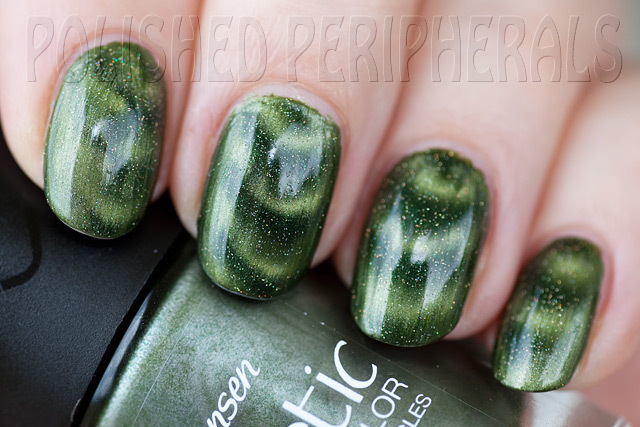 I did 2 coats with the magnet on the second coat then finished with a coat of Northern Lights for a bit of sparkle, it was looking a bit olive drab until then. I forgot how much a top coat can drag the magnetic pattern, even when fully dry. It's happened with every magnetic polish I've tried so you'd think I would remember by now. It made a bit of a mess of my index finger but then I floated it on thicker on the other nails which helped. The magnet is nice and strong and worked really well. It's easy to use. The lid comes off and the little ledge to sit on your finger helps line things up. My nails are quite curved though (end to end and side to side) so I had to be very careful not to let the high center of my nails hit the magnet while the sides and tips got very little magnetic effect. This happens with all the magnetic polishes I've tried and 'rolling' the magnetic from side to side helps. Luckily I've cut my nails short or the tips would have extended beyond the reach of the magnet. The polish is smooth, dries well and lasts a week (over PVA base). The collection is inspired by Monster High and I think it's really cool that Tara created it in collaboration with her 10yo daughter. Scared and Nerdy is based on Ghoulia Yelps. It's a shimmery blue base with red and black glitters. The blue is really quite beautiful. It would look more intense over black but I just used 3 coats on it's own topped with a coat of Seche Vite. 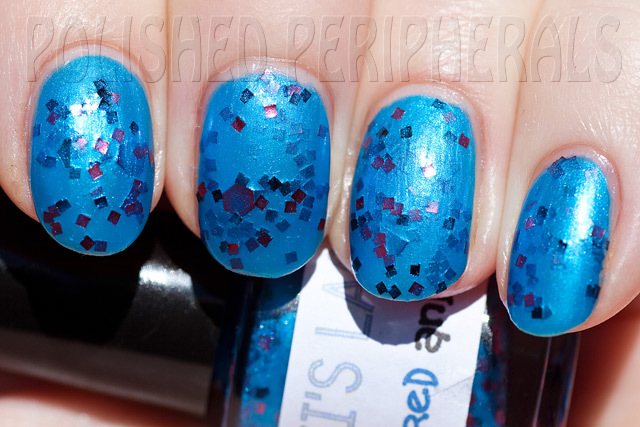 In the sun the blue is really striking but in shade or low light it's the red glitters that stand out.